A tour of Mt. Hood and surrounding ridgelines! The 100K course offers an incredible tour of Mt. Hood! This one-of-a-kind mountain race includes 9 aid stations, with 4 offering drop bag and crew access. The course is out and back, starting and finishing at Mt. Hood Meadows, traveling over to Gunsight Ridge and Surveyors Ridge and back on an amazing and very runnable trail network. This is an incredibly diverse and scenic course. Runners travel through an assortment of ecological zones, including lush midsummer wildflower meadows, sub-alpine forest, as well as a fascinating transition zone of Douglas fir/ponderosa pine forest that forms the border between wet western Oregon and dry central Oregon. Most of the course is very runnable dirt singletrack, with some hill climbing, a few rocky technical sections and a couple loose talus fields. The Timberline Trail and Umbrella Falls Trail on Mt. Hood also have several small creek crossings as well. Spectacular views await along this challenging and unique course! Click on the map image for an high resolution course map, or download a .gpx file here. The course includes approximately 11,600’ of elevation gain and 11,600’ of loss over 62.4 miles. The first/outbound 50K involves 5,100’ of gain and 6,500’ of loss, while the inbound/return 50K has 6500’ of gain and 5,100’ of loss. There are nine aid stations staffed with enthusiastic volunteers offering tasty fuel: Tailwind energy drink, water, soda, gels, Skout bars, bananas, oranges, chips, PB&J sandwiches, and more. All Daybreak races are cupless, so be sure to bring your own cup for liquid at aid stations. Crew are welcome at Bennett Pass Aid Station (#1 & 9), Surveyor's Ridge Aid Station (#4 & 6) and the Start/Finish area only. Parking is limited at Surveyor's Ridge Aid Station, and we must leave enough parking for other forest users. Drop bags will be available at Bennett Pass Aid Station (#1 & 9) and Surveyor's Ridge Aid Station (#4 & 6). SIZE: Drop bag size must be smaller than a 20L day bag, made of durable, water-resistant material. Bags that are too large will not be accepted and will not go the requested aid station. LABEL: Write your first name, last name, bib number and aid station name (Bennett Pass or Surveyor’s Ridge) in large bold permanent ink on your drop bags. RETURN: Please consider that drop bags will not be returned back to Mt. Hood Meadows until each aid station shuts down after race sweepers arrive. Have your crew grab your drop bags from the aid station if possible. Start (Mt. Hood Meadows) to Aid Station 1 (Bennett Pass): Runners start at the Mt. 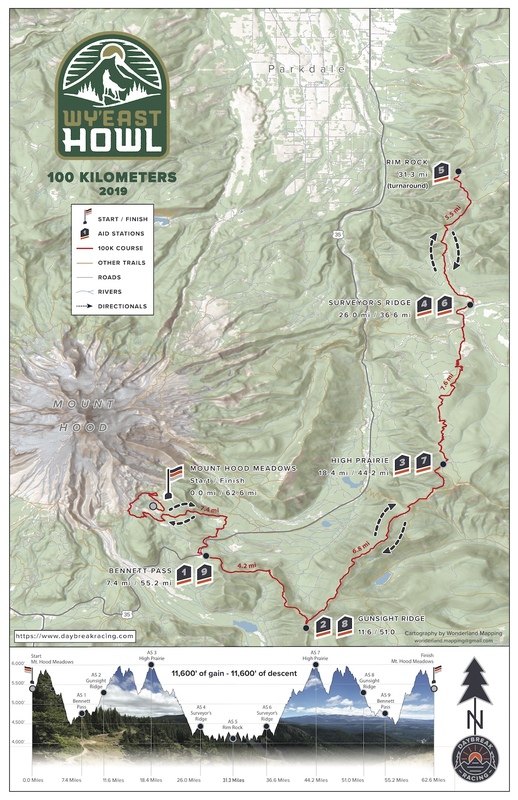 Hood Meadows lodge, then head uphill on a service road to connect onto the iconic Timberline Trail, then head west rolling along Timberline Trail to Umbrella Falls Trail, heading down the mountain for a few miles to the junction onto Sahale Falls Trail. Sahale Falls Trail ends on a historic one lane road bridge and a short paved service road to the Hwy 35 overpass over to Bennett Pass Sno Park and Aid Station 1. Except for the first mile, this section is nearly all descent. Opt for a quick transition, or take advantage of crew and drop bag access here. Aid Station 1 (Bennett Pass) to Aid Station 2 (Gunsight): Leaving Bennett Pass Aid Station, runners head east along the rugged, historic Bennett Pass Road (doubletrack jeep road) for a scenic rolling 4.2 mile stretch to Gunsight Aid Station. Views to the south open to Mt. Jefferson and the White River drainage, while views to the north offer striking views of the the Hood River Valley, Gunsight Ridge and Surveyors Ridge. The major Washington volcanoes of Mt. St. Helens, Mt. Adams and Mt. Rainier are also easily seen on clear days. Aid Station 2 (Gunsight) to Aid Station 3 (High Prairie): Upon arrival at Gunsight Aid Station, runners head north on Gunsight Ridge Trail, traversing some technical sections of talus slope, rocky ridgeline trail and high mountain larch and fir forest. This section offers spectacular views of the Badger Creek Wilderness to the east and of course Mt. Hood to the west. Gunsight Trail ends at Gumjuwac Saddle back on the historic Bennett Pass Road for a rocky 2-mile cliffside ascent to High Prairie, with some of the most expansive and magnificent views of Mt. Hood anywhere on course. Runners reach High Prairie Aid Station at the junction of the Cooks Meadow Trail and Bennett Pass Road, the highest point on the course at 5970’ along the border of the Badger Creek Wilderness. Aid Station 3 (High Prairie) to Aid Station 4 (Surveyor’s Ridge): Leaving High Praire Aid Station, runners face a long, flowing 6 mile rolling descent on the serenely forested Cooks Meadow Trail, offering several spectacular viewpoints of Mt. Hood during the first few miles, transitioning to wildflower meadows and mixed fir and ponderosa pine forest further down. The Cooks Meadow Trail crosses Forest Road 44, and immediately end onto Surveyor’s Ridge Trail. Runners turn right here, on a footbridge over the Dog River and 1.6 miles of gently rolling trail to Surveyor’s Ridge Aid Station. This is a crew accessible aid station with drop bags and portable toilets accessible. There is a 12PM cutoff at this aid station. Aid Station 4 (Surveyor's Ridge) to Aid Station 5 (Rim Rock): Runners depart Surveyors Ridge Aid Station on some seriously fun rolling trail, with sweeping views of Central Oregon to the right, the Hood River Valley to the left and Mt. Hood slightly behind. Surveyor’s Ridge forms the transition between the famously moist western Oregon climate zone and the much drier and sunnier central Oregon climate. Being in this transition zone offers an incredibly unique mix of wildlife and forest species; one minute the trail rushes through lush Douglas fir and sword ferns, while the next minute offer ponderosa pines, manzanita and sage. The course turns around at Rim Rock Aid Station, a small opening at a service road junction just below a prominent jagged rock feature, Rim Rock, home to a former fire lookout. Aid Station 5 (Rim Rock) to Aid Station 6 (Surveyor's Ridge): Halfway done, now it’s time to turn and burn on the return trip back to Mt. Hood! Runners depart Rim Rock Aid Station and begin to notice the course has a different feel on the way back. Mt. Hood looms large and proud, seen at several sweeping locations along this 5.3 mile section of Surveyor’s Ridge Trail. The course arrives back at the Surveyor's Ridge Aid Station to refresh with crew and drop bags access. Aid Station 6 (Surveyors Ridge) to Aid Station 7 (High Prairie): After topping off at Surveyor's Ridge Aid Station, runners face the biggest climb of the race, heading back up Cooks Meadow Trail. Savor the beautiful wildflowers and lush forest here, because it’s a solid grind back up to High Prairie. Aid Station 7 (High Prairie) to Aid Station 8 (Gunsight): The reward for making it back to High Prairie Aid Station is hitting the high point of the course and savoring a nice cruise down the old Bennett Pass Road with those unreal views of Mt. Hood— The mountain is indeed feeling much closer again. Runners must traverse the rugged Gunsight Ridge Trail back to Gunsight Aid Station. Aid Station 8 (Gunsight) to Aid Station 9 (Bennett Pass): Leaving Gunsight Aid Station, runners turn west along the historic Bennett Pass Road for a 4.2 mile rolling descent down to Bennett Pass Sno Park. Incredible views of Mt. Hood are seen from the “Terrible Traverse”, a narrow passage along the cliff face on Bennett Pass Road. Crew, drop bags and toilets are available here before facing the final 7.4 mile leg of the journey back to Mt. Hood Meadows. Aid Station 9 (Bennett Pass) to Finish (Mt Hood Meadows): Leaving Bennett Pass Sno Park, runners head toward Mt. Hood, continuing on the Hwy 35 overpass to Sahale Falls Trail, passing some gorgeous and roaring waterfalls on the climb up Sahale Falls Trail, then Umbrella Falls Trail. The final climb continues up Umbrella Falls Trail, then turns onto the iconic Timberline Trail, offering completely humbling and awe-inspiring views of Wy’east above, with Mt. Hood Meadows finish area down below. Timberline Trail rolls along the mountain slope, thick with wildflower meadows, all the while flowing in and out of gullies with trickling springs and creeks that form the headwaters of the Hood River. The course then descends down a quick service road to Mt. Hood Meadows (yes, you will hear and see us cheering for you! ), where runners finish at the lodge patio in full view of the mountain with friends and family!